Like any other electronics devices, sometimes, Chromecast Audio may not work properly. In this case, you need reset Chromecast Audio. This guide explains two different methods to factory data reset Chromecast Audio. The methods also applies to Chromecast. 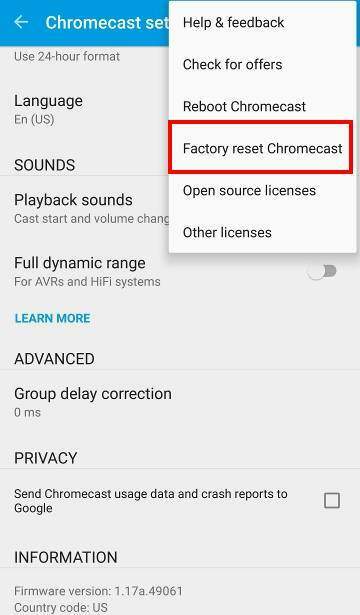 Please note, when you reset Chromecast Audio, the device will then return to “factory” state as a new Chromecast. 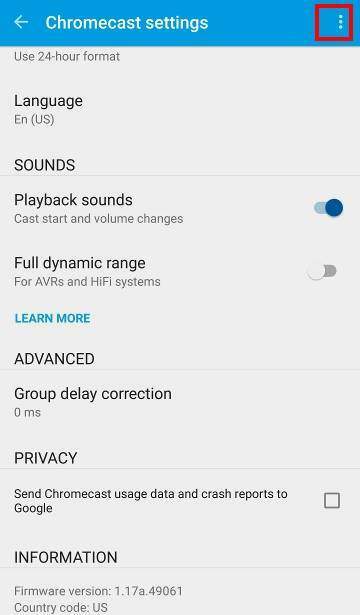 This means you need setup the Chromecast Audio as a new device after the factory data reset (FDR). When you need reset Chromecast Audio? when Chromecast Audio works oddly. Both methods work identically. But the second method (soft reset) is not accessible in some cases.. 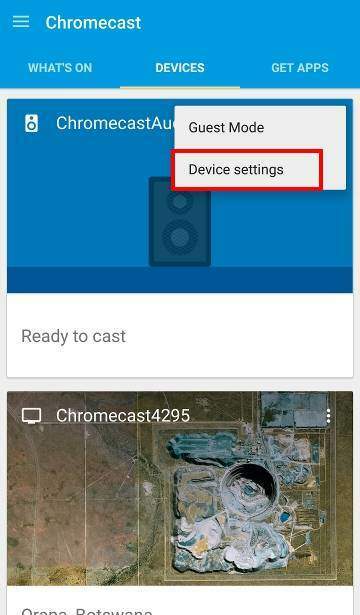 When the Chromecast App on mobile devices (or Google cast extension on PC) cannot find your Chromecast Audio device, you can only use this method to factory data reset Chromecast Audio. So, in cases 1-4 mentioned above, you will not able to find your Chromecast Audio. Unlike Chromecast, Chromecast Audio does not have a TV screen to remind you about the problems. Anyway, if your Chromecast App cannot find the Chromecast Audio device, you have to use this method to reset Chromecast Audio device. Step 1: Connect your Chromecast Audio to the speaker with one of the three supported audio cables. Step 2: Power on the Chromecast Audio. This step is important. You need power on the device to reset Chromecast Audio. As mentioned in the Chromecast Audio setup guide, you need connect the power adapter to Chromecast and make sure the power adapter is powered on. Step 3: Hold down the only button next to USB port on Chromecast Audio. Do not release the button! The LED on Chromecast Audio should change to pulsing orange (blinking). Step 4: Release the button after the LED turns white. Now it is safe to release the button. Your Chromecast Audio is now reset. Step 5: Set up Chromecast Audio as a new device. You need setup Chromecast Audio as a new device. This method can be used in all situations to reset Chromecast Audio device. 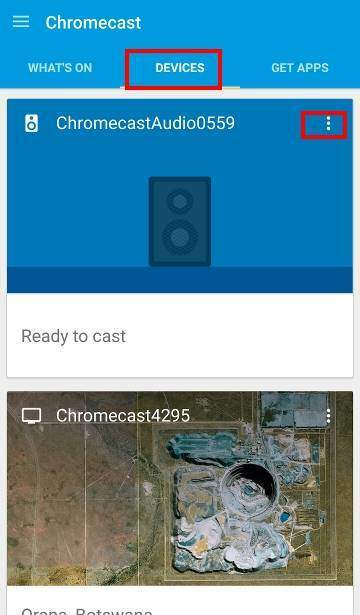 If Chromecast App can still find the device and you want to reset it, you can do it from Chromecast App in your mobile devices. To use this method to reset Chromecast Audio, you may follow these steps. Step 2: Start Chromecast App in your mobile device and navigate to Devices tab as shown below. Step 3: Tap the menu icon (3 vertical dots) and select Device settings as shown below. Step 4: Tap menu icon icon as shown below, then select Factory reset Chromecast. Step 5: Tap OK as shown below to confirm to reset Chromecast Audio. Step 6: Set up Chromecast Audio as a new device. Please note, Chromecast Audio saves and only saves one wireless network info. Whenever you change network (router), you will need reset Chromecast Audio. 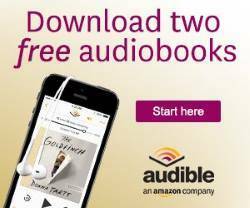 The two methods mentioned in this guide work identically. Method 1 (hardware button) cane be used in all situations. Method 2 (software/app) can be used when your Chromecast App can still find your Chromecast Audio device. Do you know how to factory data reset Chromecast Audio now? If you have any questions or encounter any errors to factory data reset Chromecast Audio, please let us know in the comment box below. Yes, Google changed the name of the app before Google Home was announced. White color usually means it’s connected to the WiFi. When you hold the button, do you hear anything from the connected speaker?